Spain are one rubber away from losing their Davis Cup title as the Czech duo of Tomas Berdych and Radek Stepanek took Saturday’s only game over four sets in Prague. As Davis Cup kings and winners in three of the last four years, Spain looked set to steamroller their way to another title when they opened up a 1-0 lead thanks to David Ferrer on Friday. But Berdych’s thrilling five-setter with Nicolas Almagro kept them alive close to midnight on Friday night, and they were on Saturday able to turn things 2-1 in their favour. With Berdych and Stepanek fronting up against Marcel Granollers and Marc Lopez, the odds were always with them as the duo have only ever lost one rubber when playing together. The form book looked false, though, when the visitors silenced a partisan home crowd to take the opening set 6-3. But the local pair got their act together after that, knowing that a failure to take this particular match could have had disastrous consequences heading into Sunday. As one of the sport’s form players, Ferrer is up against Berdych first on Saturday afternoon and it was imperative from a Czech point of view he was not given the chance to sew things up with a game to spare. The home side duly ramped up their performances levels, taking the next two sets 7-5 and then finishing things off 6-3 to head into the last day on the brink of completing a Fed and Davis Cup double and just their second Davis win ever. The first came in 1980 when Ivan Lendl played for them. As veterans on the big stage, Spain are unlikely to be too panicked, but without the injured Rafael Nadal, they will be relying on Ferrer to see off a buoyant Berdych first up, before what they hope will be a decider between Stepanek and Almagro. The weight of expectation will again fall on the shoulders of Berdych on Sunday, as he takes on Ferrer in the strongest of the singles match-ups. “We are one point away. We will do everything for that,” said the former Wimbledon finalist. The key to Saturday’s success was the near-unbreakable partnership of Berdych and Stepanek. 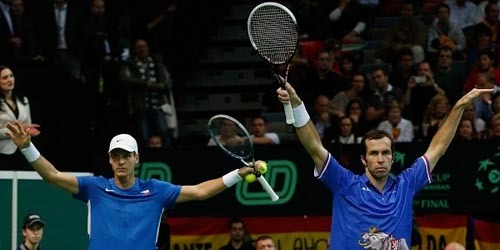 Their only Davis Cup defeat since first playing together five years ago came in the 2009 final whitewash against Spain. Berdych’s performance on Saturday was all the more impressive considering he was on court for four hours against Almagro on Friday night.